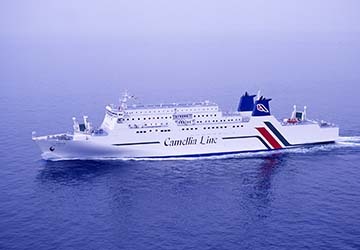 Camellia Line sails daily between the Japanese port of Hakata in Fukuoka and the South Korean port of Busan, all year round. Their name is derived from the Camellia flower, which is the city flower of Busan, and the Camellia sasanqua flower which is Fukuoka’s, the province in which the port of Hakata is located. It was founded as a joint venture between Japan NYK and Koryo Shipping, a Korean business, and now serves an important link between the two major cities. On-board the New Camellia ferry you’ll find a host of amenities to keep you occupied on the trip between Japan and South Korea including a restaurant, observatory spa bath (or spa with a sea view), duty free and gift shops, a games room, vending machines, a karaoke room and much more. There’s also a large choice of on-board cabin accommodation on offer to suit all budgets which ensures you arrive fresh at your destination. Directferries.co.uk provides an impartial ferry comparison service allowing you to view numerous ferry company timetables and fares in one quick and easy search. Compare Camellia Line timetables and prices now with all alternative ferry operators before booking your ferry ticket.